Whether it’s an in-competition or out-of-competition test, athletes are required to complete a doping control form during every sample collection session. On this form, athletes are required to declare any and all medications or supplements that they’ve ingested or used in the past seven days, and to certify that their declaration is accurate. Some athletes, however, may not understand just how important the completeness and accuracy of this declaration is. The reality is that it can possibly mean the difference between a rule violation and a lengthy period of ineligibility, or even no period of ineligibility. As we will see, there are some very good reasons to take the extra minute or two to make sure you have made a complete and accurate declaration of substances you have recently used. It is important to note that under the World Anti-Doping Code, athletes are held to a standard of strict liability, so they are ultimately responsible for what is in their systems. Inadvertent rule violations are relatively rare, but they are possible, and when they do occur they are typically the result of medications or supplements that have been insufficiently researched before using them and which contain a prohibited substance. Significant flexibility has been built into the system to try to ensure that inadvertent rule violations are addressed with less severe sanctions. An athlete can usually qualify for a reduced sanction if they are able to determine the source of his or her positive test and establish a lack of intent to cheat. This is where a properly completed disclosure of medications and supplements used by the athlete can become so important. The starting point for obtaining that flexibility in the event of a positive drug test is often whether the athlete has made a full and complete declaration of substances used on their doping control form. Frequently, where the athlete has declared a supplement or medication which later turns out to be the source of the positive test, the athlete’s declaration is considered powerful evidence of the athlete’s intent to comply with the rules and leads to a finding that the athlete has not intended to cheat. On the other hand, when an athlete fails to disclose a substance on their doping control form and tests positive, the failure to disclose can cast doubt on the athlete’s efforts to demonstrate that they were seeking to comply with the rules and this may result in a longer period of ineligibility. Therefore, it is always in an athletes’ best interest to declare all of his or her supplements and medications – both prescription and non-prescription – during every sample collection process. If you’re finding it difficult to remember all of the products you’ve used, it might be helpful to start a list, on your phone or on paper, that you update at the time of use and keep on hand at all times. This process will save you from having to remember every product when a Doping Control Officer shows up at your door or event. As an elite athlete, you need to know what’s going into your body. By declaring the use of every medication and supplement during the sample collection process, you’re also performing an audit of your own consumption and the source of those substances. As such, it can be helpful to consult with a qualified physician prior to consumption to determine if a product is safe, medically necessary, and not on the prohibited list. For athletes and their sport governing bodies, transparency and trust have always been vital in the fight for the integrity of sport. One of the best ways for athletes to uphold these principles is by declaring all the medications and supplements they ingest on doping control forms every time they participate in the sample collection process. It doesn’t matter if you’ve used the product every day, or just once in the last seven days, it will only help you in the long-run to declare every medication and supplement. As discussed above, an athlete’s transparency and communication are treated favorably under the World Anti-Doping Code. More specifically, the inclusion of a prohibited substance or a product containing a prohibited substance on a doping control form, prior to a positive test, can lead to a more advantageous adjudication outcome for the athlete, as opposed to a situation in which the athlete neglected to properly complete their declaration. If you need additional motivation to take the few extra minutes necessary to make a full disclosure, keep in mind that in the event of a positive test, it will be weeks (and in some cases more than a month) before the laboratory results are received. 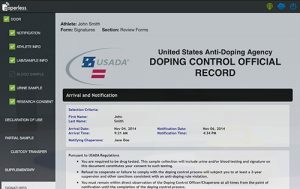 If you have not properly and accurately completed the declaration portion of your doping control form, you may have trouble recalling what substances you were using and attempting to identify the cause of a positive drug test. It is important to not compound the error of not properly researching medications and supplements with the additional unforced error of failing to adequately disclose those products on your doping control form. While the declaration process might seem repetitive and frustrating, remember that these anti-doping protocols are designed to protect you and your sport so all athletes can compete clean and win. Embrace the process – take it upon yourself to fully research and disclose every product you use because this is the best way to ensure that you are competing clean.